Meadows, fields, grassy marshes, grassy woodlands. Moist places. 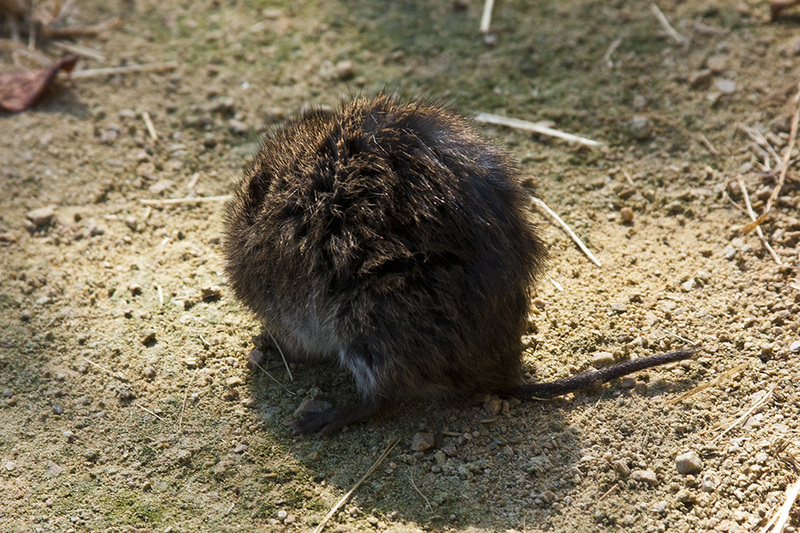 This is the largest vole found in Minnesota and the most widely distributed mole in North America. It weighs between 1 and 2½ ounces. The length of the head and body together is 3½″ to 5″. The total length, including the tail, is 5″ to 7¾″. The body is 2 to 3 times as long as the tail. The ears are small, inconspicuous, and hidden by the fur. The coat (pelage) is long and soft. It is dark brown on the back, a little lighter on the sides, and silvery on the belly. It is darker on young individuals, lighter on older individuals. The tail is 15 ⁄16″ to 2½″ long and bicolored. It is 2 to 3 times longer than the hind foot. 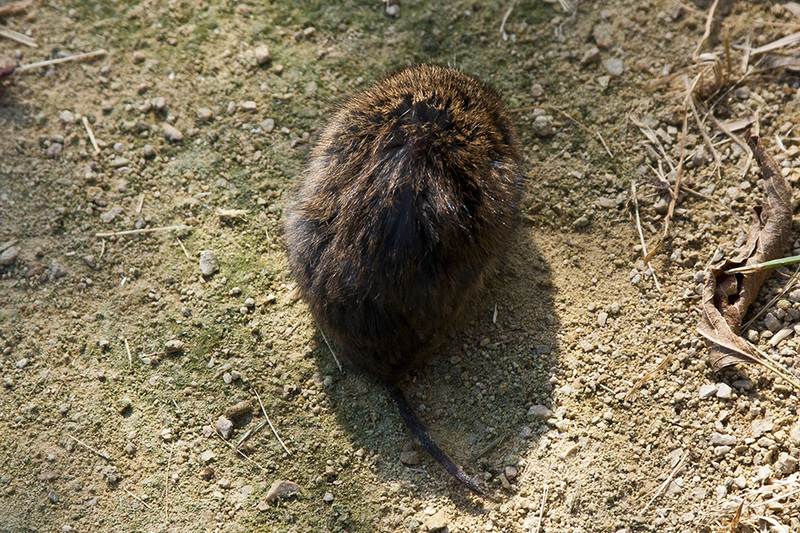 Prairie vole (Microtus ochrogaster) pelage has a grizzled appearance. The belly is yellowish. The tail is shorter, 1″ to 1¾″long. Where the ranges overlap prairie vole will be in drier areas. Diet consists mostly of grasses, sedges, and herbs, but also includes seeds, grains, and when available, tubers, bulbs, and fruits. In the winter they sometimes eat the bark and roots of woody shrubs and trees. Breeding takes place between April and December. Two to four litters are produced each year. There are usually 4 to 6 offspring per litter though there may be as few as 1 or as many as 11. Gestation lasts 20 to 23 days. Due to high nestling and juvenile mortality, an average of only 2.6 offspring are successfully weaned. The offspring reach sexual maturity at 5 to 6 weeks. Adults usually live less than one year but may live up to two years. Adults are active all times of day. 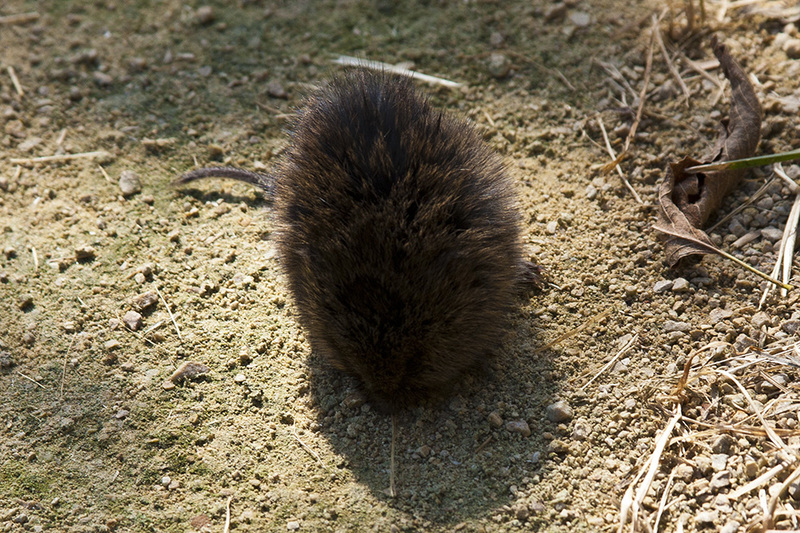 Drummond vole (Microtus pennsylvanicus drummondii) is found only in an area from Kittson County south along the Red River to Traverse County. 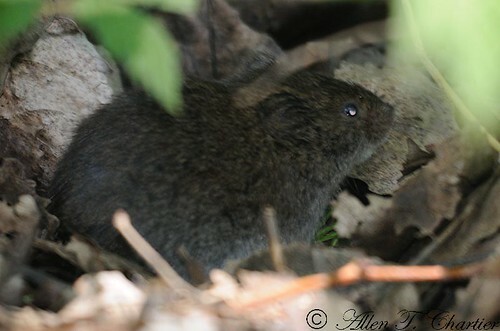 Eastern meadow vole (Microtus pennsylvanicus pennsylvanicus) occurs throughout most of the state. Photographed at the Turtle River State Park, North Dakota (23 February 2013). The meadow vole (Microtus pennsylvanicus) at the "Good" field, Bryn Athyn College campus was busy marking the camera in a clipped grassy pathway (run). A meadow vole (Microtus pennsylvanicus) climbed in a plant and started gnawing the stem. When the stem breaks and falls down, the vole runs in a panic and doesn't return. Quite hilarious, and an indication for limited intelligence. This is one meadow vole that certainly won't be doing calculus any time soon.